We always leave a comment card with our customers to mail in and here are a few things they have said. They were prompt, helpful and when they found additional problems, discussed them with us and suggested solutions. We have been pleased to use them on other occasions. You started when you said you would and worked expeditiously to finish in a timely manner - dealing directly with the other people on the job-site, cooperating with the painters and coordinating everything with us. What more could we ask! We are thrilled with the roof and delighted that we chose Asbestos-One for the largest project the church has undertaken since 1978. My husband has worked in construction his entire life and he said he has never worked with a roofing company that does such craftsmanship and goes out of their way more than this one. I would just like to say this: I am a realtor and I have used a lot of y different companies for a lot of different things. This is the only company I have called and said what to do and they do it. I have been using them for over twenty years and if they keep cleaning the way they have been, I will be using them for the next twenty years. I wasn't happy, I called a few other companies and had hired them to clean my home. 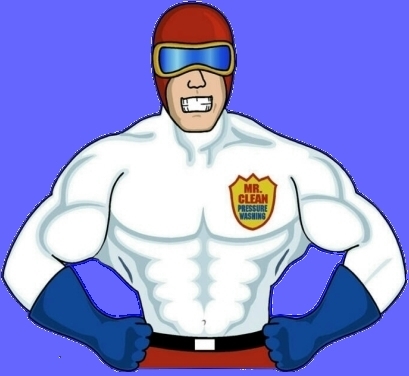 I used to have Mr. Clean Pressure Washing clean my siding with the driveway. After trying a couple others, I came back. I thought I was getting a great deal by paying almost half. These other companies came in and they were gone in an hour, my house wasn't clean, they messed up all my flowers and left dirt all over my windows. I urge you to look at what your getting for the money. It took others about an hour to clean and Mr. Clean Pressure Washing spent the entire day making everything look perfect. Thanks guys!